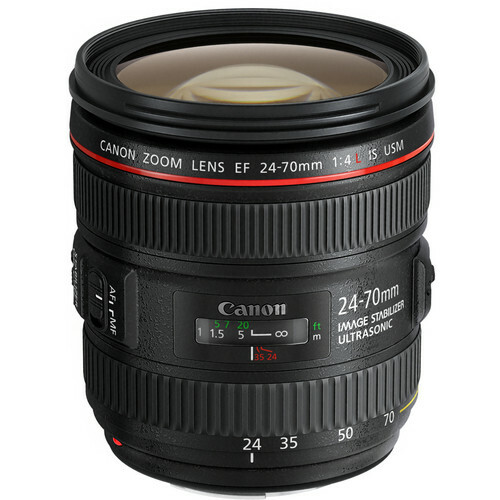 Blending a flexible zoom range with a versatile feature-set, the EF 24-70mm f/4L IS USM is a Canon L-series lens covering wide-angle to short telephoto focal lengths and featuring a constant f/4 maximum aperture. An advanced optical layout comprises two ultra-low dispersion elements and two aspherical elements to minimize a variety of aberrations and distortion in order to realize notable sharpness and clarity. A Super Spectra coating has also been applied to suppress lens flare and ghosting for greater contrast and color accuracy. 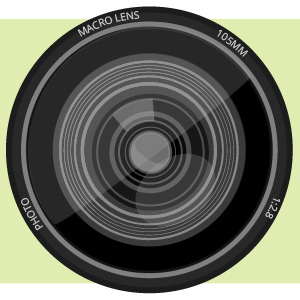 Complementing the optical performance, the lens is also characterized by its ring-type USM and internal focusing mechanism to enable quick, quiet, and precise autofocus performance along with full-time manual focus override. A dedicated macro position also enables focusing as closely as 7.9" away in order to achieve a 0.7x magnification for photographing close-up subjects. A four-stop-effective Image Stabilizer is also used to minimize the appearance of camera shake for sharper handheld shooting. Additionally, this lens is weather-sealed and has a protective fluorine coating on the exposed elements for use in trying environmental conditions. Standard zoom is designed for full-frame Canon EF-mount DSLRs, however can also be used with APS-C models where it provides a 38.4-112mm equivalent focal length range. Two aspherical elements minimize spherical aberrations and distortions for improved sharpness and accurate rendering. A ring-type Ultrasonic Motor (USM), along with an internal focusing design, optimized focusing algorithms, and a high-speed CPU, is employed to deliver fast, precise, and quiet autofocus performance as well as full-time manual focus override. Minimum focusing distance of 1.2' is available throughout the zoom range and a dedicated macro position can be used to achieve a maximum magnification of 0.7x in conjunction with a minimum focusing distance of 7.9". Box Dimensions (LxWxH) 8.0 x 5.25 x 5.25"
EF 24-70mm f/4L IS USM Lens is rated 4.7 out of 5 by 219. Rated 5 out of 5 by TravelMrJ from I would buy this product again...great walk around lens. I purchased the EF 24-70mm f/4L IS USM lens for my 5D Mark IV as a replacement for my 24-105mm f/4L II lens. I preferred the extra focal length of the new 24-105 but the portability of the 24-70 and sharpness across the focal range sold me on it. The ergonomics are good and the L designation reflects weather sealing and build quality that matches my camera. For the price, I can live with the f/4 which on the 5D Mark IV works fine in all but the darkest scenarios. I have faster lenses in my kit if required. A good walk around lens. Rated 5 out of 5 by Jeffrey from Probably the best for the price This is not as good as the 2.8 but it is half the price. That being said, it has a quite a few advantages over the 2.8. It is everybit as sharp, though the color and resolution may not be quite as good, but with its image stabilzation(whcih works wonders in low light), close focusing distance, not being as heavy as 2.8 and like all other L-series lens has great weather sealing, I might actually recommend this unless youre consistantly working in the darkest of situations where the extra-stop of light might be essential. But as a walk around lens that keep attached it is really great, particular for a lens thats under 1000. Rated 5 out of 5 by Lynn R. from Very versatile lens. I use this lens for every day,walk around purposes. It is quite good for event photography and handles low light well on my 6D. It is part of a two/three lens combination that I typically take on shoots depending on the nature of the activity. While a 24-105 might be more versatile as a travel lens, I generally pair the 24-70 with my 70-300L and do not mind having to swap lenses. I like the pinch lens cap and find the included hood acceptable for most purposes. The image sharpness, contrast and color rendition are superb. The macro feature is easy to use and seems quite effective; the IS works as advertised. Overall I am very pleased with this lens and would recommend it to a friend if it fits their specific requirements. Rated 5 out of 5 by PhotoMom from Walking around lens I upgraded my camera to a 7D Mark 2 and decided to purchase this lens as my main lens for it instead of getting the kit. I know many people opt for the 24-105mm as a walk around lens but I felt that would be too heavy to carry all the time. I already had the EF-S 11-22mm lens for wide angles, and the 24-70mm range (38-112mm effective) is a nice mid range. I shoot landscapes and architecture mostly, and so far I'm very happy with my images. I haven't found the f/4 to be a limitation as I mostly shoot outdoors between sunrise and sunset. I make and sell handicrafts, and the macro option works well for photographing my work so I can get away without a dedicated macro lens. Rated 3 out of 5 by CJ from Not as sharp as expected. Dark at 70mm Pros: Light, portable, and beautiful colors compared to 24-70mm I or 24-105mmCons: A tad bit sharper than 24-70mm I or 24-105mm but still not sharp at all. (expect almost same blurriness as 24-70mm I)IS is barely usable and is not as effective as that on other IS lenses.Expect 1-stop less light at 70mm. Not nice for video.Macro is a bit limited.Don't listen to all the hypes from Canon saying that this lens is the second sharpest lens after 24-70mm f/2.8 II. If this is the second sharpest, then third and fourth are sheer garbage. I reget I paid $$ when it first came out. I keep it for the video use but I wouldn't recommend for photography. Rated 5 out of 5 by nobody from Better than 24-70 f/2.8 I and 24-105 I really love this lens. I got it to replace my 24-70 f/2.8 L (classic) and it has better IQ than the 2.8 lens. But what I really like is that way it transformed the handling of the 5D Mark III. The 2.8 just was a big chuck of glass on the 5D - it overwhelmed it. The f/4 IS balances on the 5D Mark III very nicely. It really makes a huge difference. And the IQ with this lens and the IS are great - much better than the 2.8 and the 24-105 f/4 IS is not in the same ballpark. Great lens. I am really glad I got this instead of the f/2.8 II version. Rated 5 out of 5 by Vince, W7FA from Great Alternative to EF 24-70mm, f/2.8 The sharpness is excellent at all f/stops. Very little distortion at any focal length. Image Stabilizer effective to at least 4 f/stops. I can get no shake, no blur at 1/2 sec. exposure and 24mm focal length, if I am well supported in a chair! Very little lens flare or ghosts. However, the macro feature is not that good because one has to focus within 2-3 inches of the subject at max. magnification and that creates a shadow on the subject from the lens. Otherwise, this is an excellent lens. Any chromatic aberration and peripheral darkening are corrected by my Canon 6D, do I won't comment on this. Rated 5 out of 5 by PhillD from Great Value In A High Quality "Walk-Around" Lens Long-time Canon devotee; mostly landscape/macro work for Fine Art and Stock, and about 25% birds/wildlife. Primary landscape body is 5D Mk3. Historically shoot 80-90% off a tripod, with EF 24-105L my most used lens, but I'm in my 60's now, and trying to avoid lugging around tripod and multiple lenses all the time, by going with lighter lens with good IS capability for hand-holding. Very pleased with a EF 16-35 f/4 IS purchased a few months ago for this reason, and so far equally happy with the 24-70 f/4 IS. Both high quality, excellent IS systems and great value lenses, particularly compared to the much more expensive 2.8L versions...majority of landscape work doesn't require 2.8 speed/wide apertures, however I do have a 2.8 Macro lens and a super wide angle, non-IS.